Perfect hard-cooked eggs & easy to peel -- every time! 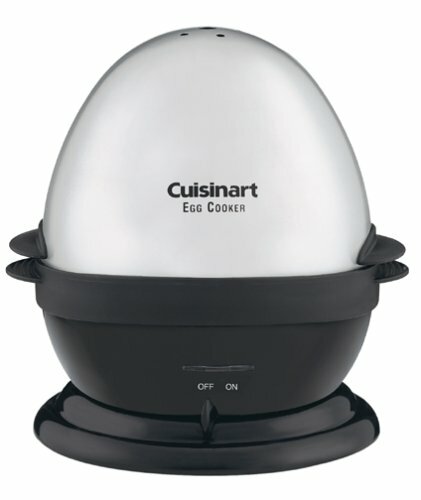 I love this little egg cooker. There is no worry of cracking and eggs are pefectly "hardboiled". I had less success with poaching, though. I find that moisture from the lid ends up in the poached egg cup leaving it a little watery and underdone in the center. 1. Water from the condensed steam leaks all over the counter when cooking eggs. 2. While it cooks hardboiled eggs just fine, the consistancy of softer boiled or poached eggs is problematic. We have experimented with the amount of water used and there doesn't appear to be any exact amount that produces consistant "cook levels". The design looks great. It does a wonderful job of hard boiling eggs. Don't even attempt to poach eggs, however. The plastic holder used for poaching eggs is so thick and heat resistant that the bottom of the eggs stay raw while the tops get overdone. I have owned my egg cooker for about a year and it was actually a replacement for one that I used so much I finally wore it out. I have read a few reviews from people who said it makes a mess inside and out (egg exploding & water leaking). First of all, the piercer that comes with it on the end of the water measuring cup is to actually PIERCE the egg on one end so the pressure inside does not cause it to burst and leak out all over the inside of the cooker. Didn't you ever wonder what the needle was for? Or read about it? Second of all, the water leakage is more than likely due to a factory defect. Mine has been working leak free for a year, but my old one did start to leak after many years of usage. Perfect eggs for the first time in my life! Hard boil, fine. Poach forget it! Looks good and works good for hard or soft boiling eggs. Don't even think about poaching eggs. The thick plastic poaching tray is so insulating that the top of the eggs overcook while the bottoms remain almost raw.